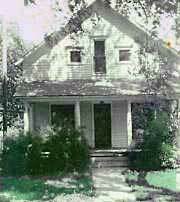 Following Bible College, we moved to Iowa, staying for a few weeks with Darrell and Lucille Reyman and Bob and Nellie Chambers at the small village of Washington Chapel near Minburn where Bob was holding a meeting for Darrell. We moved on to Guide Rock, on the southern border of Nebraska and settled there for most of a year. The church was in the throes of trouble and we landed in the middle of it. The group had just split, the larger group retaining the building and the minority going across the village of 600 to meet in a living room. The first baptism that I had was Doyall Allsman. Doyall was much taller than me. I'm not sure if he ever realized that I dropped him momentarily in the baptistry. But I remember it clearly. After that I learned better techniques. Equipment for daily living was not as handy as in later years. There was no refrigerator, the stove was a simple three-burner kerosene-fueled device that may have been used for camping. There was an outhouse near the alley way. We met some wonderful saints there including Earnest and Clara Hoffman, grandparents of Ron Edson. They were a great help, both spiritually and with food. The church could not continue to meet our salary and survival became a concern. The Hoffman's had led many in a Congregational Church at Cora, just over the state line in Kansas to understand the Lord's Church. 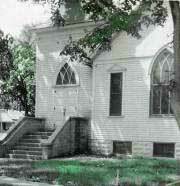 The new believers attended the church at Inavale, Nebraska after the denomination closed the building to the Hoffmans. After making some grand friends in Nebraska like Don DeBord and Dale Williamson, we returned to the west coast with a stop at Parma, Idaho to visit Ron Edson's parents, Lee and Marvel.